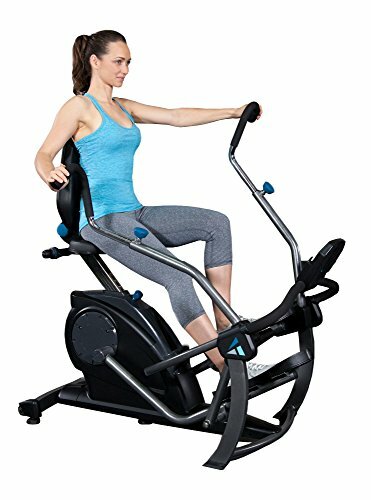 The Teeter FreeStepTM Elliptical Recumbent Cross Trainer brings a new level of ease to exercising in your own home with a stress-free, zero-impact cardio and strength workout. Delivering the calorie-burning benefits of traditional ellipticals, treadmills, and steppers while comfortably seated, the FreeStep alleviates the impact of your bodyweight on your back and joints. Its unique pedal motion path ensures the smoothest stride to protect the knees and targets all major muscle groups when combined with the synchronized handle motion. With variable magnetic resistance, a wide, 3-position reclining seat and easy-to-read console that tracks time, distance, speed and calorie-burn, the FreeStep delivers a comfortable, effective total body workout no matter your age or level of fitness. Leveraging nearly four decades of experience specializing in superior-quality back pain relief products, the Teeter FreeStep is both Back-Wise and Body-Healthy. ZERO IMPACT EXERCISE: Ideal for all fitness levels, the comfortable and naturally-reclined seated position reduces body fatigue and eliminates the stress on the joints and back while still delivering a full fat-burning cardio workout. WHISPER-QUIET, FLUID STRIDE: The unique striding motion protects your knees and joints while engaging near-silent variable magnetic resistance that adjusts with one simple dial. SMART DESIGN: Track progress with the easy-to-read, battery-powered digital console; device stand and water bottle holder; convenient transport wheels. COMMERCIAL-GRADE ENGINEERING: Friction-free linkage system means long-lasting use; 54" x 52.5" footprint is a low profile addition to your home. If you have any questions about this product by Teeter, contact us by completing and submitting the form below. If you are looking for a specif part number, please include it with your message.